Ruby Walsh's victory was his 50th at The Festival, and his fifth of this year's meeting. He leads the all-time roll of honour of jockeys at The Festival. The Willie Mullins-trained 4-1 co-favourite was headed going to the second-last fence and hampered by L'Ami Serge, but fought back after the final obstacle to win by three lengths from Bristol De Mai. Walsh said: "He jumped super, travelled really well and dug really deep when I needed him to. He was tough. L'Ami Serge quickened by me two fences out but he threw his chance away a little bit when he dived remarkably to his left and jumped straight across me. "My horse was very clever - he almost stalled himself in the air so he didn't land on the back of L'Ami Serge. When I got out around him again, my horse rattled down to the last. We were a bit a tight but he was very nimble at it unlike Navan, when he only got halfway up. "Today, when he had to get in close at speed, he knew how to get his knees up and get over it. He galloped every step of the way to the line. "He has a good cruising speed. There's a difference between pace and speed but he has a a big cruising speed. Willie decided to drop him back because he has an awful lot of pace - he likes to get on with it and could do too much in the four-miler. "I think Patrick and Emmett Mullins had him as a point-to-pointer and Graham and Andrea [Wylie] bought him off the lads after they had won a point-to-point with him, but chasing was always going to be his game. "This time last year, when he got ran over in the Albert Bartlett Novices' Hurdle, we were thinking where we were going to go with him, so to come back and win a JLT is just great. "How would you ever think you were going to ride 50 winners here? When I drew level with Pat Taaffe that was a dream come true, so to get to 50 is incredible, but you can't get here without having the horses. I was very lucky to spend so long riding for both Paul [Nicholls] and Willie, and now to have Willie's team as well. It doesn't matter how good a jockey you are, if you don't have the horses you can't ride the winners." 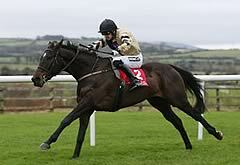 Owner Graham Wylie said: "He was touted for the four-miler, but Willie got it right because he wouldn't settle. He was great today but his stamina held out, I thought he was beaten at the second-last. "We had a great day yesterday with every emotion. We had a winner (Yorkhill), a second we weren't expecting (Shaneshill) and a faller at the last when it looked like he was going to win (Voix Du Reve) and then one just beaten in the bumper. Any winner and you're happy, though. "Willie buys good horses, that's the most important thing, and then he places them in the right races and his whole team work tirelessly." Mullins continued: "I thought he was a stayer at first, but he showed a lot of speed when he won at Navan. The better ground has probably been a big help to him as well. "Ruby's first ever ride for me was in a 19-runner bumper and he came from last to first and I said then he was the future - 50 winners is fantastic, he's always in the right place. "I don't know where this horse will go now."